Those are all of the things I look for when I am entertaining and need a good appetizer to serve up. I am not one to spend too much time on what comes before the big meal. So, over the years I have defaulted to a few favorite simple hors d’oeuvres that are simple to whip up but still look fairly fancy-shmancy. They are also naturally gluten-free AND dairy-free AND egg-free AND soy-free AND easily nut-free. So…basically perfect for any of those guests (or family members) with food sensitivities. And…I just happen to be sharing these recipes today as part of our Gluten-Free Holiday Progressive Dinner hosted by Daily Bites. 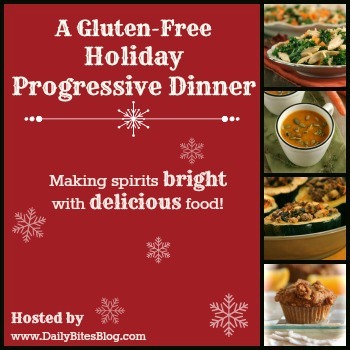 Each day a different blogger is serving up a different course of a wonderful Gluten-free and Dairy-free Holiday Meal. Each day there will be a new GIVEAWAY hosted at each blog as well. Hint: My giveaway is below. Do NOT miss out on your chance to win! And now for these 4-Ingredient Simple Gluten-Free Appetizers. 1. Preheat oven to 375 degrees. Separate Prosciutto slices and cut each slice into quarters so that each cut piece is now about 1 inch wide by 3 inches long. 2. Take a mini muffin pan and press 2 slices, criss-crossed over each other, inside each opening, to form a cup. Bake for 15 minutes. Let cool 10 minutes – they will crisp up as they cool – then remove from pan and fill each with 1 Tbsp chopped pears then top with about 1 Tbsp chopped arugula. 3. Drizzle about 1/4 – 1/2 teaspoon of Balsamic vinegar over each cup. Serve and enjoy. Optional: these are also wonderful topped with a small dollop of goat cheese if you or your guests are not dairy-free. 1. Preheat oven to 375 Degrees. Line a baking sheet with Parchment Paper. 2. Make a small slice in each date to remove pit. Fill space where pit was with chopped pistachios. 3. Lay cut bacon piece on work surface, sprinkle some chives on top of it, then place date in center and roll bacon around date. Place bacon-wrapped date seam side down on parchment paper. Repeat with remaining dates and bacon pieces. 4. Bake for 20-22 minutes, or until bacon is nicely crisp. Let cool for about 10 minutes and place on serving platter and top with some chopped pistachios and chives for garnish. Optional: These are also very good stuffed with a small dollop of goat cheese as well if you or your guests are not dairy-free. UPDATE: The winner had been notified by email and this contest is now CLOSED. 2. Follow Cook It Allergy Free on Facebook, or leave a comment telling me if you already do. The contest will end on Tuesday, December 18th at 9am PST. The winners will be announced then. You must be at least 18 years old to enter. Your appetizers have my mouth watering, Kim! Your holiday photos look so festive. 🙂 Thanks for your delicious contribution to the party! Oh gosh, these are so smart and easy! I love them! Gosh, I’m SO behind in my blog hopping!! I need to spent the whole day catching up on all these awesome posts. I’ll be checking out this “Progressive Dinner” as it looks to be perfect timing for healthy recipe needs. Thanks to all of you festive GF bloggers! 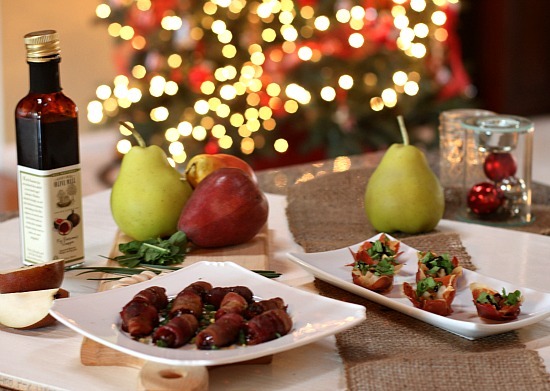 PS: Bacon wrapped dates sound unbelievably good (and easy). I’m definitely “swiping” this recipe. I need some appetizer recipes and dates are always a winner in my book. Thank you, thank you, thank you! Hi! Yum, BACON! I already likes on Facebook, done sharing, and I would love to win the cookbook. Thanks for the offer! The small plates part intrigues me. Looking for some great GF recipes in that area! Thanks for sharing these recipes also! I am intrigued to follow someone else’s gluten free journey as well as discover some new sweat treats/small plates as I’m cooking for one! 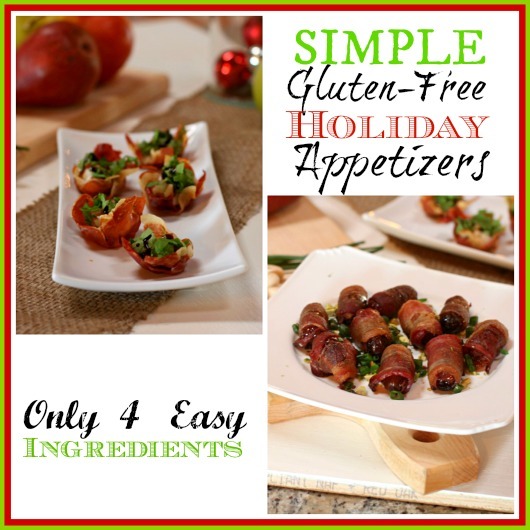 Looking for some great ideas that are gluten free for entertaining! Looks very appetizing! Small plates are always intriguing because the possible combination of flavors are endless! I adore entertaining and LOVE the look of small bites (both sweet and savory) so this cookbook would be awesome!!! I Liked Cook It Allergy Free on FB! Thanks! I love appetizers and small treats. Would love more ideas! Such a simple yet flavorful recipe – I love it! I need more recipes like this so that I have less anxiety about entertaining! I am intrigued by this cookbook – I thumbed through it at Anthropologie recently and it looked promising. It has some really different and yummy ideas that don’t seem overly complicated. This is a new area of cooking for me and my family so I’m always looking for new things to cook. GF can be so boring, but not here. I already follow you on Facebook. follow the entire site. Thanks for sharing with us! I entertain friends all the time because I love to do it and this book has got so excited because it looks sooo easy and beautiful that I can’t wait to try it all on friends and family. I have several friends who are gluten free/dairy free/ egg free and we are all gluten free in my home so I would LOVE LOVE LOVE to win a copy of this book!!! I have been taking my family along with me on a Gluten free journey for the past year and a half. We are finding so many good recipies and things we like! 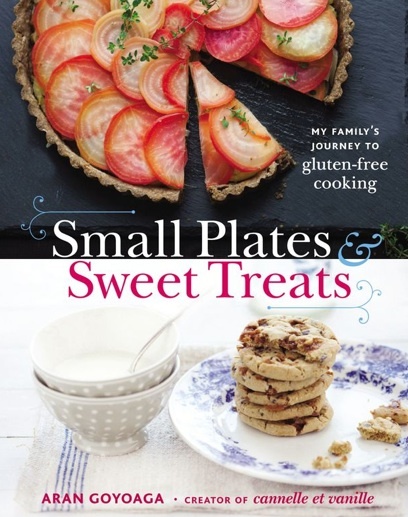 I try and collect as many recipies as I can to help with this and keep it exciting and your cookbook catches my attention because we so like to eat hors d’ ouevres style and love our sweets, both of which are hard to find gluten free! Thanks for your recipies today- I look forward to making BOTH of them! My hubby and I are both GFree so I’m always looking for tasty ways to make meals quick and easy or just easy yummy apps! Liked Cook It Allergy Free to follow on FB! I am intrigued by this book because I love small plates and love to do parties centered around small plate dishes! Small plates sounds like perfect portions for my gluten free girls. We are always looking for new small meals since they eat smaller portions several times a day around dance. These appetizers look great. And I love that they are quick and easy! I love the idea of “small plates” that also are gluten free! Half of my family is currently gluten free so I’m always game for ways to help them feel “normal” with food! The short ingredient list intrigues me, as longer lists usually contain something I can’t eat! I love that these look simple and easy, right up my alley! I shared this post on Pinterest. I shared this post on Twitter. I already follow you on FB. Have for awhile now. And I DO of course get all your updates on facebook! I follow you in fb. ALways looking for new recipes! I love cookbooks! And this idea is just perfect! Thanks for the giveaway! These apps look fab! Will try them for sure! Would love love love to win Aran’s cookbook! I follow her beautiful blog and have made and loved many of her recipes!!! Shared this post on Facebook. I have a hard time coming up with idea for small plates so this would be awesome! I like the idea of appetizers completely allergy free, I’m wondering what yummy recipes are in this cookbook! I have never seen a gluten free cookbook like it. I would also like to get into entertaining and this book would be perfect! Appetizers are my favorite part of any meal! Love these. Small plates, what a great idea, keeps us from over indulging. I love the idea of a cookbook for appetizers/small dishes. I am definately going to be trying out the Pear and Arugula Stuffed Proscuitto Cups. I have become a big fan of balsamic over the past year. I would love to learn more gf recipes – especially appetizers – so this book would be wonderful. I’m in desperate need of some appetizer recipes! This book would be perfect 🙂 BTW-LOVE your blog! I’m really interested to see the dessert recipes. It’s the one place I struggle! This book is gluten free. I don’t have any allergies, but know people who do. It would be great to be able to bake foods that I can share with other even if they have an allergy. I have been wanting to change our eating habits. This seems like the perfect place to start. I believe this will help lessen my hubbies allergy symptoms, and simply put our family on an intentional path to enjoy a healthier lifestyle. Looking forward to gluten free recipes! Thanks for sharing goodness with others. I am such a nibbler when it comes to appetizers but am finding it hard at holiday parties as so many are filled with gluten and dairy, this book will give me lots of great ideas for allergy-friendly appies 🙂 Thanks! The dates are yummy!! I have a couple of co-workers who always bring their own goodies for work parties and I made the Bacon Wrapped Dates. Not only were they a hit but they were very much appreciated by those who live gluten-free lives.